A milestone is a project management tool used to mark a stage of development within a project. Milestones can be assigned to core staff members and can contain information specific to this project. iLab Milestones are visible to both core staff and customer, allowing both sides to see the progress of the project. 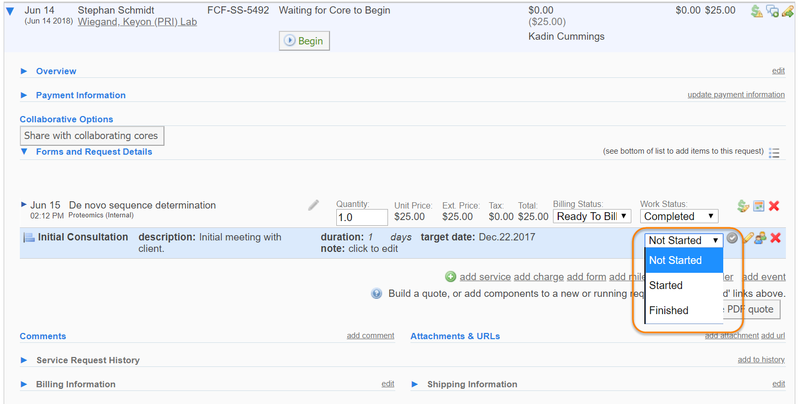 Additionally, auto-generated emails can be set for core staff to see when one milestone has been completed and another needs to start. 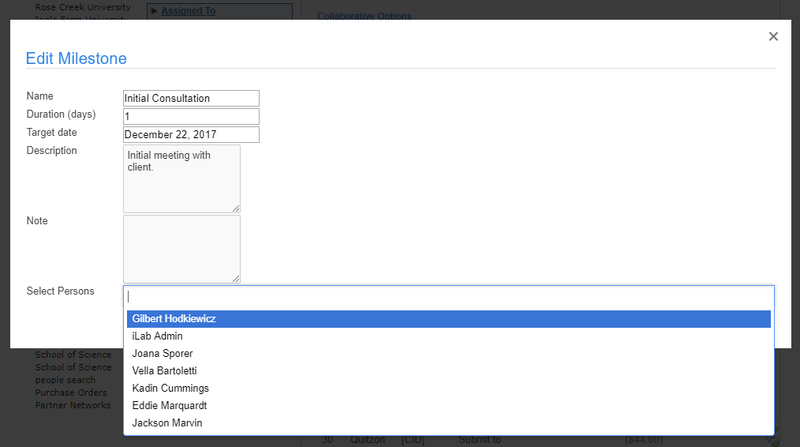 To assign milestones, begin by accessing an individual service request on your View All Requests tab. Navigate to your service request, then click on the blue arrow to expand the service request view. Below all charges and forms will be the "add milestone" link, click on the link. The milestone window will display. Name your milestone. This can be core specific and is a free text field. You can also choose to include a duration for the milestone and target date for completion. A description of the milestone can also be added. Note: iLab does not validate any of these fields, they are informational only. Click "save" and close the window. 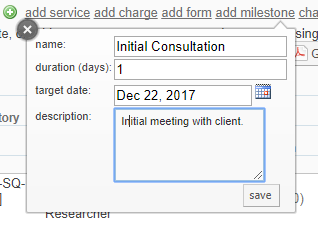 Your milestone will display in the service request. Once a milestone has been added, you have the ability to assign core staff members from the View All Requests tab to the milestone by clicking on the yellow pencil icon. Click "save", then exit out of the window. Your milestone is now assigned. Note that if you hover over the people icon, the assigned members display. Once a milestone has been added, you may manage and track a milestone throughout the cycle of the service request. You can also define which milestone notifications are sent to which users in the Email Settings‍ . To change the status, click on the status bar. You may select from "Not started", "Started" and "Finished". If you would like to edit an existing milestone, click on the yellow pencil icon beside the milestone. The Edit Milestone window displays allowing you to make changes. Click "save". Then exit out of the window.